Welcome to the Reading Kingdom Giveaway! The Reading Kingdom is an online English Language Arts program that uses effective and innovating techniques to teach students, ages 4 to 10 years old, how to read and write to a third grade level. Early literacy is sooo important, so get your child off to the best start! 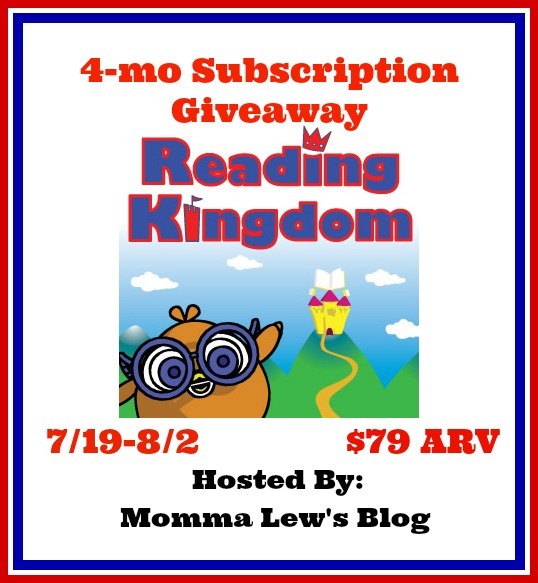 Find out more about The Reading Kingdom software by reading Momma Lew's review HERE. The Reading Kingdom would like to give away a 4-month subscription to one lucky reader! Giveaway is open worldwide, 18+. Giveaway begins midnight EST 7/19 and ends at midnight on 8/2. To enter, follow the steps via the rafflecopter below. Disclosure: My Life According to Pinterest is not responsible for prize. If you have any questions about this giveaway please send an email to Momma Lew's Blog at reesann723@yahoo.com. All entries are optional, if you do any of the tasks you can collect the entries, but if the winner task is a task you did not complete, a second winner will be chosen. Winner has 48 hours to respond by email to claim prize or a second winner will be chosen. I try to keep it fun by keeping them active while learning and going to different locations to learn! I try to use games! Lots and lots of games! Popcorn site words! Spelling city site!